This is Episode 6 and it’s our last episode of season 1. 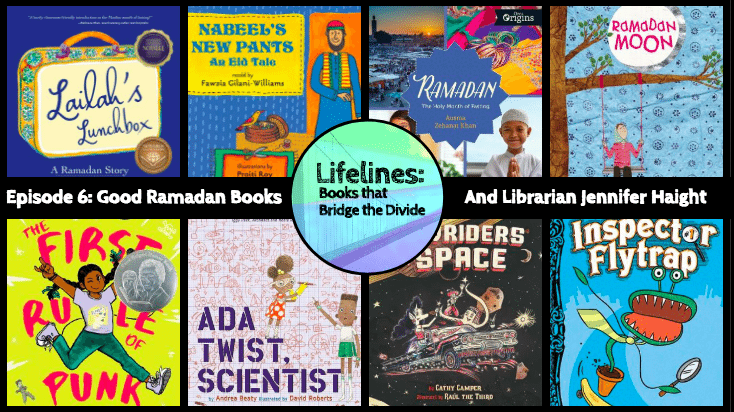 Today, Saadia will focus her “Books You’ve Never Heard Of” segment on good books about Ramadan, and then Ann will share her conversation with public librarian Jennifer Haight. Then, after a break for the summer, we’ll be back for Season 2 in the fall. Make sure you subscribe on iTunes or Stitcher so you don’t miss it! I love thinking about the discussions in bean bag chairs that are happening at Jennifer’s library in Houston, Texas. And I’m excited to go check out the books about Ramadan that Saadia recommended. I’ve been thinking a lot about the role books can play in reducing ignorance. I know I was super late to this party, but I just read Out of My Mind by Sharon Draper, and I’ve been seeing things with new eyes ever since. Before reading I don’t think I wouldn’t have focused much on the fact that I didn’t know what it’s like to live with cerebral palsy. But now that I can see my previous ignorance more clearly, I know that it kept me in a place of fear. Fear of doing the wrong thing. Fear of difference. And it meant that when I saw a couple I know who have a son with cerebral palsy, I can recognize in retrospect that when he was there, I was trying to be friendly, but inside I was really holding my breath. Because of the ignorance. But one book has changed all of that. Granted it was one amazing book, but still. Think about how our society can change for the better simply when more of us are familiar with Ramadan. So, let’s all help Saadia spread the word about these books. Because you don’t necessarily think of yourself as ignorant until a good book shows and opens your eyes. Speaking of good books, we all know that books only work if we can get them into kids’ hands. If you’re a teacher or librarian at a school where you don’t have access to enough books, check out the #KidsNeedBooks movement on Twitter. There was just a big round of giveaways and there will be more in the future. You can follow the hashtag #KidsNeedBooks and find out more at the Teacher/Librarian page on my website annbradenbooks.com.